If you're scouting for a casual yet chic outfit, consider pairing a grey plaid double breasted blazer with a grey plaid mini skirt. As well as very comfy, these two items look great paired together. 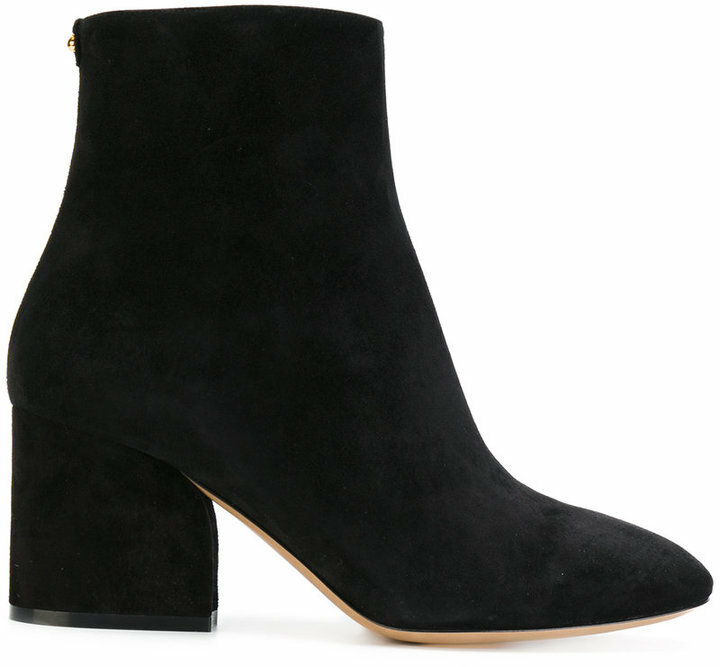 Rocking a pair of black ankle boots is a simple way to add some flair to your look. If you're looking for a casual yet incredibly chic look, team a black tweed jacket with navy skinny jeans. These pieces are very comfy and will look great when worn together. When it comes to shoes, this ensemble is finished off nicely with Salvatore Ferragamo wave heel booties. Try teaming a blue denim jacket with black ripped skinny jeans to be both casual and killer. Add black ankle boots to your ensemble for an instant style upgrade. If you're in search of a casual yet absolutely chic ensemble, rock a white and red print crew-neck t-shirt with light blue denim shorts. These pieces are totally comfy and will look stunning when worn together. Spruce up this ensemble with black ankle boots. Consider wearing a black tuxedo dress for a totaly chic getup. When it comes to shoes, this getup is complemented wonderfully with Salvatore Ferragamo Wave Heel Booties from farfetch.com. For a knockout-meets-totaly chic getup, consider pairing a black coat with dark green leather skinny pants — these two pieces fit really well together. When it comes to footwear, this outfit is complemented nicely with black ankle boots. If you're after a casual yet absolutely stylish look, marry a white coat with black leather skinny jeans. Both of these items are super comfortable and they will also look great when worn together. When it comes to footwear, this outfit is round off nicely with Salvatore Ferragamo wave heel booties. For a casually elegant look, reach for a grey tweed coat and black leather skinny pants — these two pieces fit really smart together. When it comes to shoes, this getup is complemented wonderfully with Salvatore Ferragamo wave heel booties.